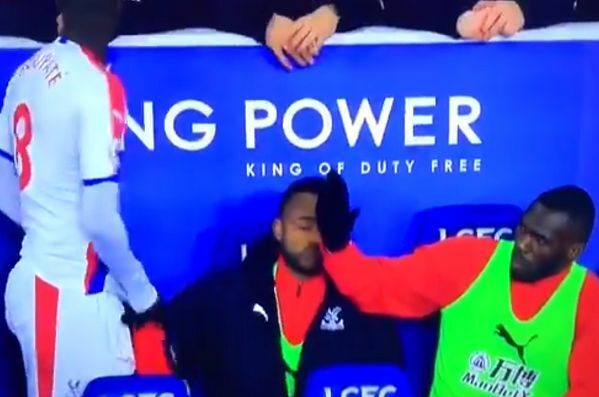 Cheikhou Kouyaté left Christian Benteke hanging on a high five that never arrived during Crystal Palace’s 4-1 win at Leicester City. The midfielder was preparing to come on as an 80th minute substitute for Andros Townsend when his team-mate raised a hand from the bench. Apparently Kouyaté did not see Benteke’s attempted gesture, because it was offered for an excruciatingly long time before it was retracted again. Roy Hodgson’s Eagles were only 2-1 to the good at that stage, so the moment called for concentration rather than a party atmosphere. On-loan Michy Batshuayi opened the scoring on his first Palace start, with Jonny Evans equalising for the Foxes in the second half at the King Power Stadium on Saturday. Wilfried Zaha then put the visitors back in front and added another in stoppage time after Luka Milivojević scored from the penalty spot. The resounding win took Crystal Palace within one place and two points of Leicester in the Premier League table – they lie 13th and 12th respectively.